Since its founding in 1968 Duma has become the absolute world top in the sales of forklift trucks and construction machinery. Duma Sale sells forklifts, mini excavators, aerial platforms, excavators, telescopic handlers, reach trucks, pallet trucks and numerous other construction equipment of various brands. You can purchase both new and used construction equipment. Our Duma-team is always on hand to offer the appropriate construction machine for the appropriate budget! The global sale of forklifts and construction machinery is coordinated from our base in Belgium, Marke, along the E17. On our property of 22 000 m² you will find over 1,300 types of construction machinery for sale. Are you interested in buying a construction machine or do you wish to offer your construction machine for sale? 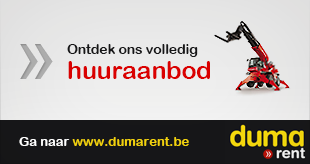 Please contact Duma Sale on +32 (0) 56 71 46 71 or fill out our online contact form. You need to log in to continue.